Maintaining a healthy diet doesn’t have to mean eating the same salad every day. From green detox smoothies to spicy tomato soup and frozen vegan desserts, mix things up and get a healthy kick out of NutriBullet’s range of blenders. 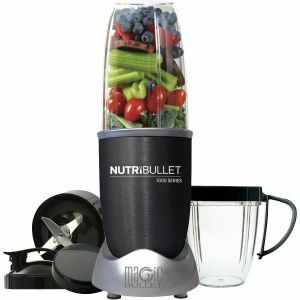 Using what the brand calls ‘Nutrition Extraction’, products like the NutriBullet 1000 and NutriBullet RX are claimed to break down fruits, vegetables, nuts, seeds and other plants in a way that squeezes more of the vitamins and minerals into your drink or dish to get the most out of each blend. Each item also comes with a recipe book to help you whip up some ideas. 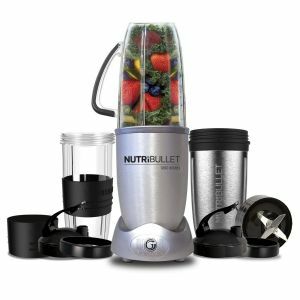 The NutriBullet range includes products like the original NutriBullet 600 blender, as well as other models such as the NutriBullet 900, NutriBullet 1000, NutriBullet Select, NutriBullet Balance, NutriBullet 1200 and Nutribullet 1200W 10 Piece. 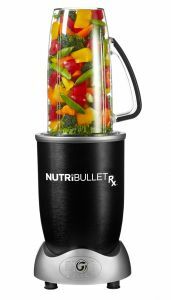 Other blenders available from the brand include the NutriBullet RX, Veggie Bullet and Magic Bullet. 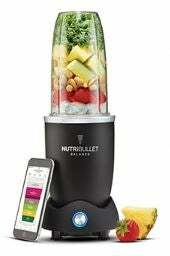 The NutriBullet range typically costs between $119.99 and $349.99. For people who are just entering the ‘world of juicing’ and making at-home smoothies, the NutriBullet 600 is the cheapest blender available from the NutriBullet range. It uses a 600W motor to create around five servings, which can be filled into a 500mL tall cup. With a blending power of 900 watts, NutriBullet states this blender will break down the toughest ingredients including seeds, wheat grass and whole fruit. It comes with one extractor blade, flip top to-go lid, a 900ml colossal cup and lip ring, plus a 700ml cup with a handle. It currently retails for the same price as the above model. If you’re searching for a blender to begin making nice smoothies at home, the NutriBullet 1000 provides 1000W of power and includes a 9-piece set. Unlike some of the other models available from the brand, this features different AutoBlast Cycles. If you like the NutriBullet 1000, but want more of an all-rounder kitchen blender, the NutriBullet Select allows you to use the appliance to blend as well as mince, puree and crush food. It also has a variable speed function which allows you to choose different speed options, depending on what you’re making. The NutriBullet Select provides 1000W of power and can dish up approximately 7 servings. Unlike many of the other blenders available in the range, the NutriBullet 1200 has premium accessories like a stainless steel cup that’s claimed to keep drinks cool for up to eight hours. And like the Nutribullet 1200W 10 Piece, this model offers 1200 watts of power and includes two AutoBlast Cycles which pulse and automatically switch off after reaching what the brand describes is ‘optimum extraction’. One of the most expensive blenders in the NutriBullet range, the 1200W 10 Piece is said to fit a larger amount of ingredients as well as provide ‘more power, more convenience and more functionality’ than the other products from the brand. The NutriBullet 1200 Series blender offers a 1200W motor and includes two pre-programmed AutoBlast Cycles. It comes with 900mL cups and is said to create up to approximately seven servings each time. The latest addition to the NutriBullet pack is this Balance blender. It boasts Bluetooth connectivity, allowing you to track nutritional information, blend smoothies and select recipes from your phone. It comes in a 9-piece set, which includes a 1200W power base, two comfort lip rings, two colossal cups (900ml), two flip-top to-go lids, one stainless steel extractor blade, plus a user guide and manual. If you’re craving something a bit stronger, the NutriBullet RX contains a 1700W motor and is said to be the most powerful appliance from the brand. It comes with hands-free SMART Technology, to help you multitask in the kitchen, as well as a heating cycle to cook up a wider variety of dishes. Some of the accessories include the RX Extractor Blade and Souperblast Pitcher with a 2-piece. Make healthy eating fun by using a spiralizer to create kids’ zucchini ‘spaghetti’, or quickly shred cauliflower rice to spice up your usual salad desk lunch. 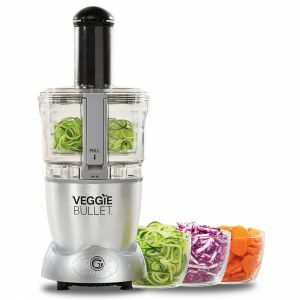 The 3-in-1 Veggie Bullet is a food processor that features a spiralizer, shredder and slicer to create a variety of dishes. Like many NutriBullet blenders, the Veggie Bullet comes with a cookbook featuring more than 70 recipes to help inspire a little creativity. Flex your cooking chops and get creative with what NutriBullet describes as the most versatile ‘must have’ tool in the kitchen. From onions to coffee beans, the Magic Bullet is claimed to chop, dice, grate and grind as well as blend and juice a range of ingredients within seconds. The multipurpose appliance is also said to come in a compact design for convenient use. Should I buy a NutriBullet blender? Described to do more than juice and blend drinks, NutriBullet provides items designed to offer flexibility in the kitchen, with its range giving you plenty of options when it comes to dinner time. 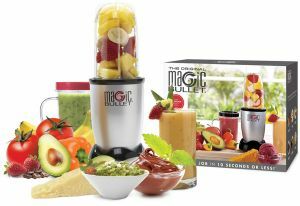 If you’re looking to change your diet, the Magic Bullet can also function as a food processor as it can chop, dice, grate and grind items like coffee beans and onions to create different dishes like dips and pancakes. 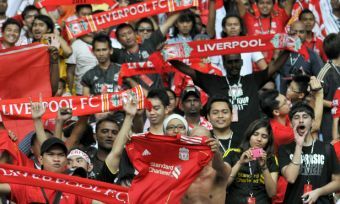 It is also said to blend and juice ingredients, offering more versatility than some of the other NutriBullet products. The fact the compact appliance is the lowest priced product from the brand might also make the Magic Bullet an ideal option. For those who just want a blender capable of mixing a variety of ingredients, the classic NutriBullet series provides different models with powers ranging from 600W up to 1200W. Since many of these blenders are said to produce multiple servings each time, the collection may be suitable for families and other healthy households. Still unsure if a NutriBullet blender is the best choice for you? Find the ultimate blender by comparing a wide selection of brands with Canstar Blue’s customer satisfaction ratings via the link below.